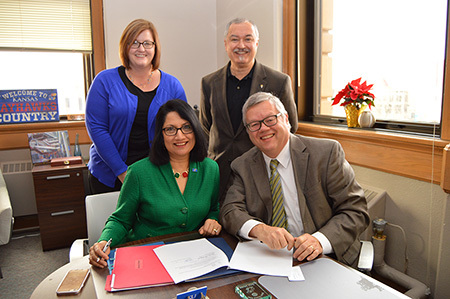 Pictured: KU Provost Neeli Bendapudi signs MOU to extend the Academic Health Department with Lawrence-Douglas County Health Department to 2020. The Lawrence-Douglas County Health Department and the University of Kansas Center for Community Health and Development created a partnership called the Academic Health Department, the first in Kansas and one of only a few in the country. Pictured: Vicki Collie-Akers, faculty liaison for the Academic Health Department, talks about the community health plan during a community meeting at the Health Department.